Health testing our dogs is vary important to us here at Mircoa Boxers. 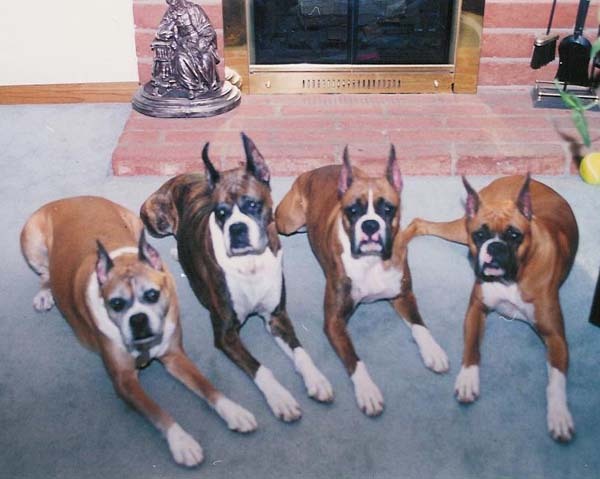 To help insure the quality of our boxers.Every effort is made to breed healthy boxers with sound bodies and good temperments. We will health test all our dogs before breeding or when they come of age. U-Turn's Mystic Image,CGC/ eyes Cerf. clear,SAS clear, Holtored 0 in 2002 and 0 in 2004, and 0 in 2008, OFA hips GOOD, DM carrier, ARVC hep. pos. I pride myself in breeding dogs that are not only pleasing to the eye with beautiful head pieces, correct movement,and good overall confirmation but that are versatile working dogs as well. All the dogs here at Mircoa Boxers have or are working towards the AKC CGC test. They are currently in training in obedience and/or agility.